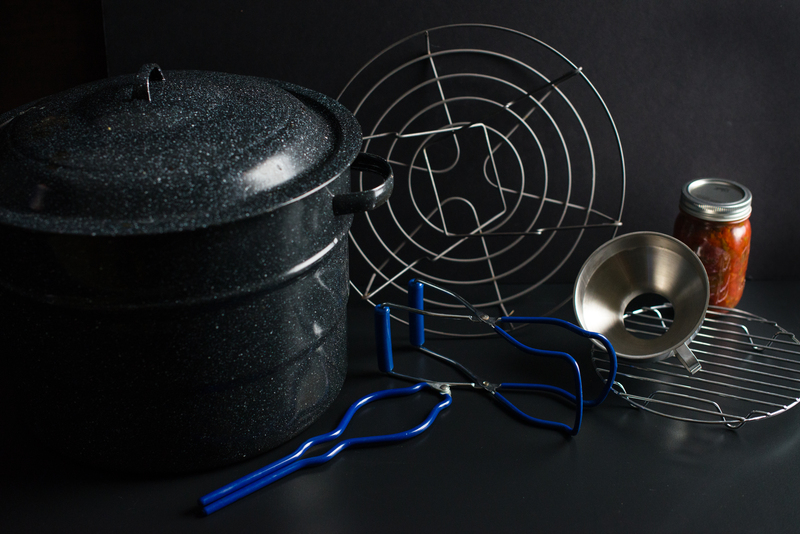 Several of these items can be bought together in a canning kit. Keep in mind, I am just a beginner, but I found that besides the prep time, canning salsa was pretty easy. There is room to add in spicier peppers if you want a medium or mild salsa. For our mild salsa we used 1 jalepeno and poblano pepper, but spicier peppers like serrano can also be used. You can also make a mild version, and then spice-lovers can sprinkle a dash of cayenne pepper just before eating. We had to use two big pots to cook our salsa, but this recipe can be cut in half for a smaller batch. Alternatively, you could make this in two pots, one mild and one spicy (adding hotter peppers into the spicier batch). Make sure jars are sterilized in the dishwasher or immersed in boiling water for 10 minutes, and lids are cleaned and placed in simmering water at least a few minutes (You can use your water bath canning pot to sterilize your jars, and keep the water hot for canning once your salsa is ready). To skin the tomatoes, boil a separate large pot of water, and fill a large bowl with ice water. Remove skins of tomatoes by cutting a shallow “X” in the bottom and placing in the boiling water for about 20-30 seconds. Remove with kitchen tongs and plunge into ice water. When cooler to touch, skins should peel easily. Tomatoes can be peeled 2-3 at a time in this way. Cut each tomato in quarters, squeezing out seeds and extra water. Dice all the tomatoes. Divide all the ingredients equally into two pots if you are making a full batch, (unless you are making a mild and spicy version, then divide hot peppers accordingly). Bring to a boil, an cook for 15 minutes. If there is an excessive amount of liquid then discard some of it (I had to skim off off about 4 big ladles full of liquid from each pot, as our tomatoes were a bit watery). While salsa is cooking, boil water in water bath (if it’s not already heated from sterilizing step). 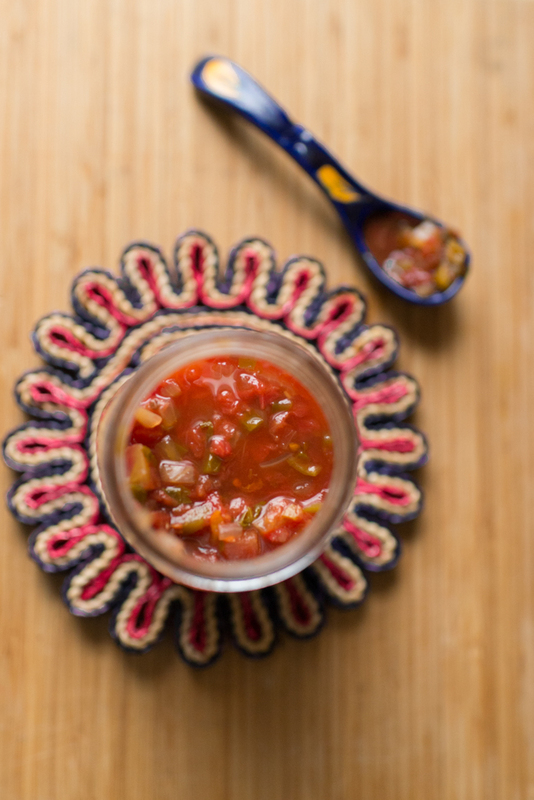 Once salsa is done, spoon salsa into jars using your canning funnel. Leave about 1/2 inch headspace (the space between the top of the salsa and the top of the jar). Use the bubble remover by sliding it in the side of the jar to remove any trapped bubbles. Wipe the rim of the jars and place the lids on top. Screw the lids on, but not too tightly. Place jars in the water bath (not directly on the bottom, but on the jar rack) making sure the water covers the jars at least one inch. Once the water reaches a boil again, leave in for 15 minutes. Turn heat off and leave in another 5 minutes. Remove jars with jar lifter and place on a towel over a heat-proof surface. When cooled you will notice the jar top will “pop” so that you can not be push it in and out. This should happen in 24 hours. If it does not, then refrigerate and use the salsa right away. Jar rims can be loosened slightly when stored (to prevent moisture from rusting the lid).